Throughout pregnancy, water plays a vital role. On average, it represents 60% of your weight, and is completely renewed every 7 weeks, primarily through the water you drink. In addition, this water contributes to the formation and renewal of the amniotic fluid, the environment in which your baby develops and lives for the first nine months of life. At 25 weeks, the fetus itself is nearly 90% water. The quality of the water you drink is therefore crucial both for your own health and your baby’s. Water continues to play a key role in your baby’s development even after birth. For the first several months, babies’ sole source of nutrition is either breast milk or formula. And in both cases, the primary ingredient is water. In fact, 87% of breast milk is water, the water you drink. This water must be of natural purity, consistency and unique balance. That’s why evian® Natural Mineral Water is perfectly suited for both mother and baby. Its light, neutral taste makes it a pleasure for you to drink all day and night, and is particularly appropriate during this key stage of baby’s development. As your baby grows, you’ll want to take special care to protect him/her. Here again, choosing the right water to accompany your baby’s development is ever so important. 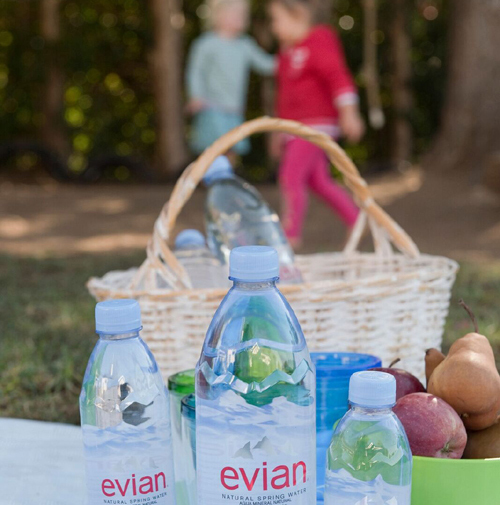 evian® Natural Mineral Water is free from all pollutants and contains a very low level of nitrates (always less than 10 mg/liter). evian®’s reliable mineral balance (less than 1,000 mg/liter of total weight remaining after evaporation) protects baby’s fragile little kidneys against potential overload. Naturally pure, delicate and uniquely balanced, evian® Natural Mineral Water is perfectly adapted to your baby’s changing needs. Month after month, during this formative period of life when water is truly fundamental, make sure you give your baby the best protection and guarantee to support healthy development.